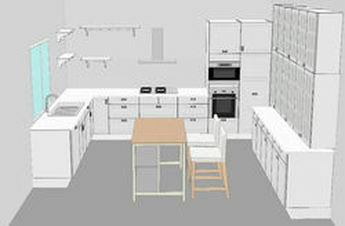 Over the last 10 years, Assembly Squad has designed, assembled and installed hundred of IKEA kitchens. Our installers are skilled craftsmen who implement specialized techniques for the specific assembly and installation of frame less,Ikea cabinetry including IKEA kitchen, wardrobes and closet. 4. Custom work such as deco strip and cover panel are NOT included with cabinet installation price. Why to choose IKEA kitchen? IKEA kitchens and wardrobes are designed around the "frame-less" concept that is the industry standard for Europe. Many local installers are unfamiliar with this type of cabinetry and approach the installation process with a "how hard can it be" attitude. Most North American cabinets are pre assembled "face-frame" cabinets and most installers only have experience with this type of installation. Here at Assembly squad we know the Ins and Outs of frame-less cabinetry. We will install your cabinets according to manufacturer's instructions which are the only way to install it right . You can expect only the highest standards of workmanship and professionalism. It is very difficult to estimate the actual cost of a complete remodel or installation. To estimate your cost we will need a detailed design, item list, and/or an on-site visit. Take a few moments to fill out our contact form, E-mail us or give us a call(312 544-9150). Once we have received the information we will give you a good idea of your cost. How long will it take to install my cabinets? A wardrobe installation can take between several hours to several days depending on the complexity of the installation . 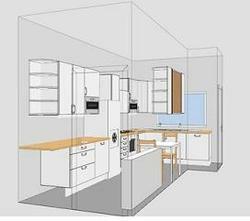 A kitchen installation can take between 1 day to several days depending on size and services included. A full project which may include demolition, plumbing, drywall and electrical work might take up to 7 days or more. I want to save some money how much of the work can i do my self? Should i do my own assembly and let assembly squad do the installation ? Won't i save money that way? Assembly Squad does not recommend an " assembly only" or an "installation only" service. We are very particular about how the cabinets are assembled as the strength of the frames is based on proper assembly. We know what we are doing and strive for only the highest standard of installation. We have visited countless job sites where the repair costs alone amounted to what the initial cost should have been. Countless installations make perfect! We do not say all of this to sell you more services ( although admittedly that is what happens when we assemble and install) We find our customers satisfaction levels ( which we measure) are higher when we perform both services. ​ASSEMBLY SQUAD LLC IS NOT ENDORSED BY, AFFILIATED WITH, OR SPONSORED BY INTER-IKEA SYSTEM B.V. IKEA IS A REGISTERED TRADEMARK OWNED BY INTER-IKEA SYSTEM B.V​.